The story of the Hopi, who does every important thing in his life according to a traditional pattern and accompanied by appropriate religious ceremony, would not be complete without some account of birth, marriage, and burial. Not having seen these ceremonies, the writer offers the record of authoritative observers. Babies are welcomed and well cared for in Hopiland, and now that the young mothers are learning to discard unripe corn, fruit, and melons as baby food, the infant mortality, once very high, is decreasing. Natal ceremonies are considered important. 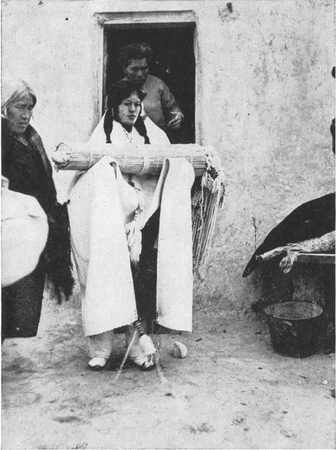 Goddard gives us a brief picture of the usual proceedings: "The Hopi baby is first washed and dressed by its paternal grandmother or by one of her sisters. On the day of its birth she makes four marks with corn meal on the four walls of the room. She erases one of these on the fifth, tenth, fifteenth, and twentieth day of the child's life. On each of these days the baby and its mother have their heads washed with yucca suds. On the twentieth day, which marks the end of the lying-in period, the grandmother comes early, bathes the baby and puts some corn meal to its lips. She utters a prayer in which she requests that the child shall reach old age and in this prayer gives it a name. A few of the women members of the father's clan come in one at a time, bathe the baby and give it additional names. After the names have been given, the paternal grandmother goes with the mother and the child to the eastern edge of the mesa, starting so as to arrive about sunrise. Two ears of white corn which have been lying near the child during the twenty days, are carried with them. The grandmother touches these ears of corn to the baby's breast and waves them to the east. She also strews corn meal toward the sun, placing a little on the child's mouth. As she does this, she prays, uttering in the course of her prayer the various names which have been given to the child. The mother goes through a similar ceremony and utters a similar prayer. "The names given relate in some way to the clan of the one who bestows them. Of the various names given to the child, one, because it strikes the fancy of the family, generally sticks ... until the individual is initiated into some ceremony. At that time a new name is given." For instance, a Hopi man of middle age, known to the writer as George (school name), tells her that his adopted father belonged to the Tobacco Clan, so the name selected for him by the paternal aunts was "Sackongsie" or "green tobacco plant with the blossoms on." Bessie, born in the same family, was named "Sackhongeva" or "green tobacco plant standing straight." The nine month's baby daughter of a Hopi girl once in the employ of the writer is merrily called "Topsy," although formally named Christine in honor of the school superintendent's wife. Her mother explains that the father's clan is Tobacco, and the aunts named this baby "Topt-si," "the red blossom on top of the tobacco plant," which sounds so exactly like Topsy that the family sense of humor has permitted the nickname. One of the writer's Hopi girls was named "two straight, tall rows of corn," another, "Falling Snow." These pretty names, too long for convenience, are nevertheless cherished, as a matter of sentiment, by their owners. The following is Hough's description of the wedding ceremony at Oraibi: "When the young people decide to be married, the girl informs her mother, who takes her daughter, bearing a tray of meal made from white corn, to the house of the bridegroom where she is received by his mother with thanks. During the day the girl must labor at the mealing stones, grinding the white meal, silent and unnoticed; the next day she must continue her task.... On the third day of this laborious trial she grinds the dark blue corn which the Hopi call black, no doubt, glad when the evening brings a group of friends, laden with trays of meal of their own grinding as presents, and according to the custom, these presents are returned in kind, the trays being sent back next day heavy with choice ears of corn. "After this three days' probation ... comes the wedding. Upon that day the mother cuts the bride's front hair at the level of her chin and dresses the longer locks in two coils, which she must always wear in token that she is no longer a maiden. At the dawn of the fourth day, the relatives of both families assemble, each one bringing a small quantity of water in a vessel. The two mothers pound up roots of the yucca, used as soap, and prepare two bowls of foaming suds. The young man kneels before the bowl prepared by his future mother-in-law, and the bride before the bowl of the young man's mother, and their heads are thoroughly washed and the relatives take part by pouring handsful of suds over the bowed heads of the couple. While this ceremonial ... goes on ... a great deal of jollity ensues. When the head-washing is over, the visitors rinse the hair of the couple with the water they have brought, and return home. Then the bridal couple take each a pinch of corn meal and leaving the house go silently to the eastern side of the mesa on which the pueblo of Oraibi stands. Holding the meal to their lips, they cast the meal toward the dawn, breathing a prayer for a long and prosperous life, and return to the house, husband and wife. "Shortly before sunrise, the bride, arrayed in her finery, performs the last act in the drama, called 'going home.' Up to this time the bride has remained in the house of her husband's people. Wearing the large white blanket, picturesquely disposed over her head, and carrying the small blanket wrapped in the reed mat in her hands, she walks to her mother's house ... and the long ceremony is over ... for in this land of women's rights the husband must live with his wife's relatives." The bride may not appear at a public ceremonial dance until the following July, at the Kachina Farewell ceremony, when all the brides of the year turn out in their lovely wedding blankets and white leggings, the only time this blanket is ever worn after the wedding (during life), save one the naming ceremony of her first child. It becomes her winding sheet when at death she wears it in her grave, then after four days, she takes it from her shoulders and uses it as a magic carpet when, having reached the edge of the Grand Canyon, she steps out upon her ceremonial blanket, and like a white cloud it descends with her to Maski, the underworld paradise of the Hopi. Are the Hopi married in this way today? Most certainly. Figure 12 shows a Hopi girl who worked for the writer for three summers. She is a fine, intelligent girl, having gone more than halfway through high school before she returned to her home on Second Mesa to live. This is her wedding picture taken last year at the moment of her "going home," after just such a wedding ceremonial as described above. Figure 12.—A Hopi Bride.—Photo by Colton. A letter from friends of the writer states that her baby is just now going through his natal ceremonies in the good old Hopi way. If the Snake Dance is continued till he grows up—it makes one shudder to think of it—he is in line to be a Snake priest! Here we have the account of Goddard: "When an adult dies, the nearest relatives by blood wash the head, tie a feather offering to the hair so that it will hang over the forehead, wrap the body in a good robe and carry it to one of the graveyards which are in the valleys near the mesas. The body is buried in a sitting position so that it faces east. This is done within a few hours after death has occurred. The third night, a bowl containing some food, a prayer-stick offering, and a feather and string, are carried to the grave. The string is placed so that it points from the grave to the west. The next morning, the fourth, the soul is supposed to rise from the grave and proceed in the direction indicated by the string, where it enters the 'skeleton house.' This is believed to be situated somewhere near the Canyon of the Colorado." Any bodies of young children who have not yet been initiated into any fraternity are not buried in the ground, but in a crevice of rock somewhere near the mother's home and covered with stones. A string is left hanging out, pointing to the home of the family. The spirit of the child is believed to return and to be re-born in the next child born in the family, or to linger about till the mother dies and then to go with her to the underworld. If the adult spirit has led a good life, it goes to the abode where the ancestral spirits feast and hold ceremonies as on earth, but if evil it must be tried by fire and, if too bad for purification, it is destroyed.